The lighting at sunset filters through the clouds over the peaceful waters off Northern Vancouver Island in British Columbia, Canada. A glowing sunset shines from beyond the clouds reflecting off the water and silhouetting the landscape off Northern Vancouver Island in British Columbia, Canada. Small ripples across the ocean's surface dance in the sunset lighting, a picturesque sight when heading back home after a day on the water. Fishing boats have returned home, cruise ships have passed by, barges are far and few between and pleasure crafts have called it a day which leaves the wildlife alone to enjoy their natural habitat. These waters are home to the Northern Resident Killer Whales between mid-June and late October and often boats traveling these waters during the calm, sunset hours, can hear blows off in the distance. Other wildlife spotted in these waters on any given occasion, are Humpback Whales, Sea Lions, Bald Eagles, Dalls Porpoises and Pacific White-sided Dolphins. Northern Vancouver Island has plenty to offer, a short list being the scenery, hiking trails, beaches, native villages, kayaking, boating, fishing, boat tours and the beauty of Cape Scott Provincial Park. 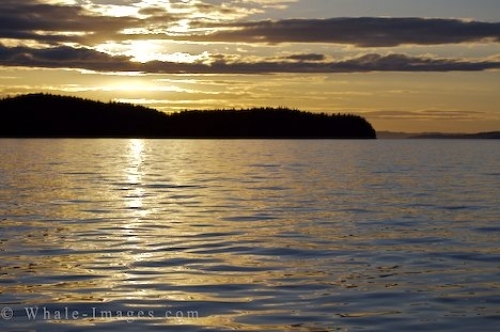 There are hundreds of hidden treasures on Northern Vancouver Island and the local people in the coastal communities enjoy a slower pace of life where a sunset is truly appreciated. Northern Vancouver Island is one of the prettiest places in British Columbia, Canada and the serenity during the sunset hours is the ideal way to end a day.